I write books and articles for a living, and consequently I use Microsoft Word more than any other Windows application, including Visual Studio. I began using Word 2007 earlier this month and within hours — literally, within a few hours on the first full day of its installation — I became a convert. I'm hooked on the ribbon, and I totally love this new UI. I've always been interested in the ways that software demands drive computer hardware improvements, and better hardware makes possible more interesting software. I think the Office 2007 UI is a glimpse into the compelling possibilities afforded by higher resolution displays. This ribbon interface would have been simply inconceivable even just 5 years ago because people weren't using suitable displays for it. Regardless how many pixels your screen has, Word 2007 uses 140 of them at the top for the user interface. With 800 × 600, that's nearly a quarter of the vertical display size. The Office 2007 System Requirements indicate a minimum display size of 1024 × 768. Frankly, that seems dishonest to me. 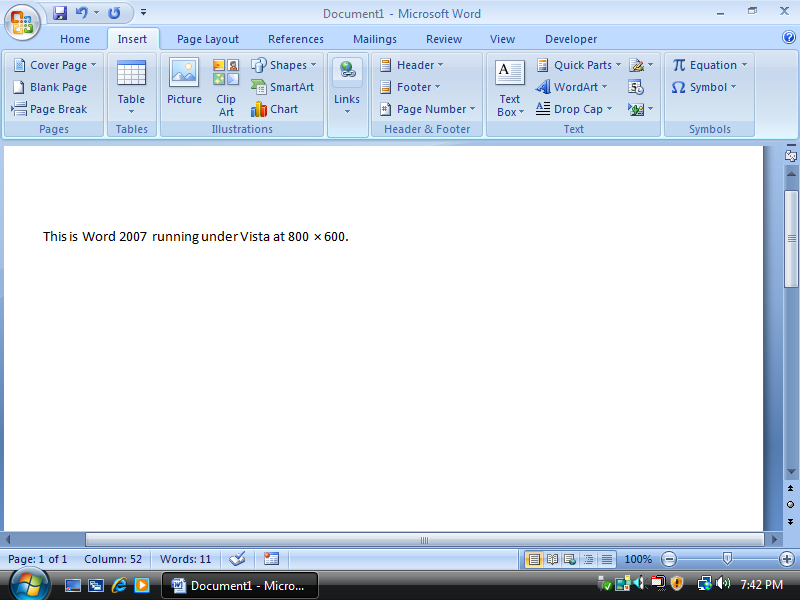 I'm using a display of 1600 × 1200, and I can't imagine running Word 2007 on anything smaller. So, when our friends and family come to us (the supposed "experts") for advice about buying their next computer, and they wonder how many Gigahertz and Gigabytes they need, the first words out of our mouths should be "Get at least a 20-inch display." And in our travels we should always carry baseball bats, so when we happen upon an old 13" or 15" CRT that some unfortunate soul is still using, we can smash it to tiny pieces and do everyone a big favor.